Last weekend my whole family and I attended the Huon Vally Show. It is a rural festival for the whole Huon Valley, showing various displays of interest. My children had some art in an art show and won a couple of awards, which was very cool. We all got a big kick out of the animal shows, such as the dog show and the farm animal displays. We also sat for an hour watching the equestrian events and a demonstration by some elderly lumberjacks (one of them was 80 years old! I remarked to Kitty that he was much fitter then I… she didn’t disagree, which is a little disappointing). George Cowen, one of the older participants in the wood cutting competition. This image is from the Huon Show website. 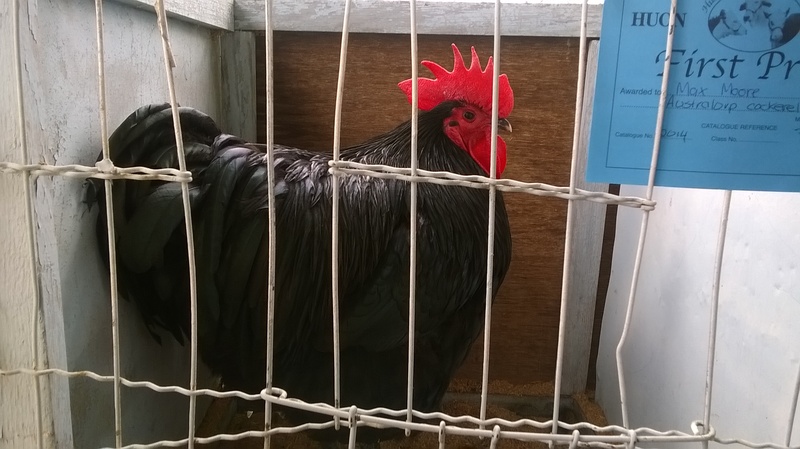 One thing of major interest to me was the chicken displays, showing the winners of the breeds in each category. I spent much more time than my children wanted me to spend examining each breed and making note of the better qualities of each. I was very interested in the Orpington Buff, Orpington Black, and a very confident looking Australorp Rooster. While I was checking out these magnificent animals I struck up a conversation with a gentleman who owned several of the entrants in the competition. He told me some very interesting information about raising chickens on pastures, telling me that he does this in Bridgewater (to the north of Hobart). I was told that it takes him 5 minutes, from killing a bird to having it fully dressed on the table…. all plucked and everything. I was amazed at this, telling him that it took me around 10 minutes to do this, if I skinned the bird. He gave me some points for plucking the bird, such as keeping the water between 70-72 degrees Celsius to ensure that the feathers come off easily. He told me that the feathers on the bird that are hard to remove can be removed by taking a handful of feathers and scrubbing the area. He told me a fascinating story about the olden days, before supermarkets were common and when chickens were not usually sold dressed. He told me that there was once a man who was amazingly fast at plucking chickens. This man would come home from work and begin killing and dressing chickens, working for a couple of hours he would produce 60 or so chooks – the man’s wife would deliver them to butchers the next morning. One of the larger chicken producing companies had a chicken plucking machine that was also amazingly fast. Apparently, they challenged this man to a plucking competition. The man accepted and on the day of the challenge the machine started first. The machine apparently plucked the chicken in 30 seconds, which is extremely fast. The man then stepped forward and he plucked a chicken in 27 seconds, which is unbelievably fast. Now, to end this entry, please be amazed by this weird chicken I saw at the show, sitting on a bench and drinking a cup of water.